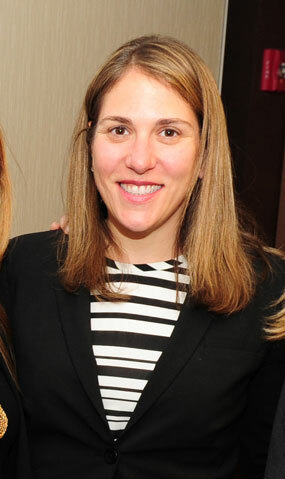 Erica G. Starrfield of Pepper Pike has been awarded the 2015 Bennett and Donna Yanowitz Leadership Award by the Jewish Federation of Cleveland. The award recognizes and honors an outstanding young individual who has demonstrated commitment, involvement, and leadership within Cleveland’s Jewish community. Starrfield was presented the award at the Federation’s Board meeting on February 29. Starrfield is a mother of 2 and a Marketing Manager at Nestlé USA. She holds a B.A. from the University of Michigan and an MBA from Georgetown University. She is the immediate past Chair of the Federation’s Marketing and Communications Committee. Under her leadership, the organization’s branding initiative became a nationally recognized model for other Federations around the country. “I want to see the Jewish community of Cleveland continue to prosper so that it can remain the place that brings the support and enjoyment we have come to know it for," she said. Starrfield continues to be an active member of the Marketing and Communications Committee, in addition to being a member of the Strategic Planning Committee and the Federation’s Board of Trustees. She is also involved in Women’s Philanthropy. Her involvement extends beyond the Federation. Starrfield is a graduate of the Anti-Defamation League (ADL) Glass Leadership Institute. She also sits on the Board of Directors at Park Synagogue. The Bennett and Donna Yanowitz Leadership Award replaced the Marvin and Milton Kane Award, previously known as the Ed Baker Award. The award has been given annually since the early 1960’s. As recipient of the Yanowitz Award, Starrfield is invited to join the Cleveland delegation to a General Assembly of the Jewish Federations of North America.